When we bought "LOUD AND PROUD" from Carl Kent, I thought we had found the most complete and the stoutest featured spot boar anywhere, and still do. He has gotten even more impressive with age and his offspring have come to prove how good he is. "BIG AND BOLD" is just what his name implies! He's dead on wide chested and massive coming at you and the same dead on width and squareness going away; huge feet, big legged, tall fronted, massive over his blades and he brings that same massive width down his top and out through his rump--as good of hip and rear leg set as you can make. A littermate gilt to Big and Bold was the Champion spot gilt for the Robert Alvidrez family at the Andrews Co. Stock in TX. A littermate barrow to Big and Bold was the Champion spot barrow and the Res. Champion overall purebred barrow shown by the Chris Acosta family, El Centro, CA. 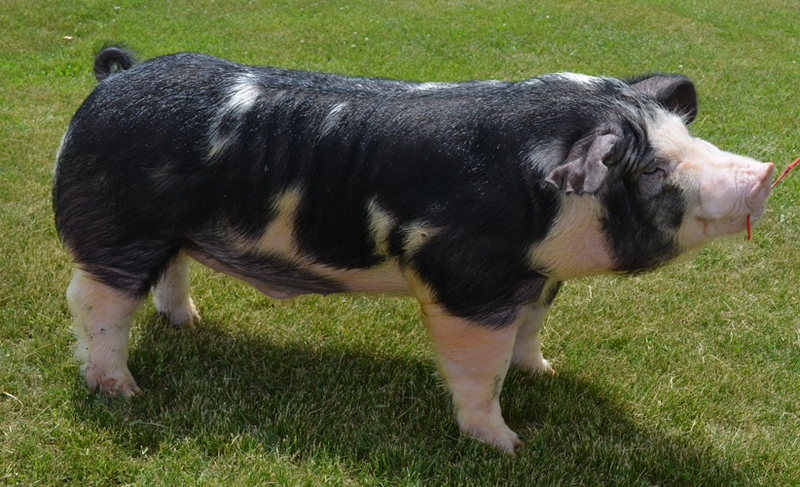 "BIG AND BOLD" is one stout featured, correctly designed spot boar.